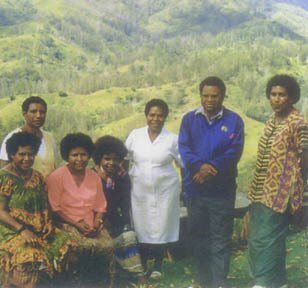 5/5/98 a meeting was convened for interested participants from an ICRAF Workshop held in Goroka. The participants had a brainstorming session and pooled ideas together for the concern of the women and children of the province. Mission Statement was to promote and develop awareness of Family Rights and Responsibilities and aim to promote family and family related issues. Save the Children New Zealand is the main funder although Family Voice have over the years received funds from the German Development Service (DED) for the training program. DED is currently funding the Children's Program Officers position. UNICEF and individual donors have also asisted in some of the programs. Profile: Established in up in 1995. Initial staffing was 4. Presently the numbers of volunteers are 1500 who help carry out awareness raising throughout the islands. The goal of the group was to create a world safe for women and their children. Aims and Objectives: To provide workshops, campaigns, advocacy work, educational awareness for the public, schools. Provision of crisis counseling services for families, women victims and survivors of different forms of violence against women. 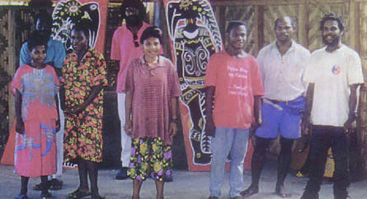 Profile: February 1995, at the request of the AusAID police adviser to the East Sepik Province, the first Provincial Workshop was conducted by the FWCC’s coordinator, Ms Shamima Ali. This was done in association with four different agencies in the East Sepik Province: the Police; Community Development Division; Division of Health; East Sepik Council for Women. This workshop provided the foundation of the establishment of the ECAVAW in April 1995. It is a grassroots women’s organization that is attempting to effect change in the East Sepik with regards to violence against women. It is a full-time crisis counseling and support service provider and has been actively involved in legal aid and support services. 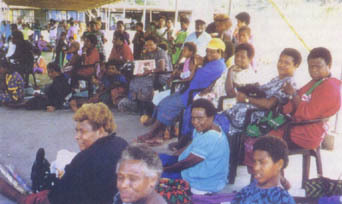 Aims and Objectives: To provide support and counseling service for victims of gender violence; increase public awareness on the issues of gender violence; co-ordinate and foster co-operation between the agencies dealing with gender violence; establish open forums of support for the Committee and it’s work from different sectors of the community; provide effective public advocacy service in relation to the issue of gender violence. Funding: Numerous funders include AusAID; Canada Fund through CUSO; NZ SCF, Asia South Pacific Adult Education; Global Funding for Women. Profile: East New Britain Sosel Ekson Komiti (ENBSEK) is an incorporated non-government organization. Established in 1988 and has been running programs on the islands in the province. The focus is on environmental awareness; landowners rights; domestic violence and women’s rights; alcohol and drug awareness; information on AIDS and sexually transmitted diseases. Also provides counseling for victims of domestic violence. to look at ways of reforming laws which will better help victims of violence. The Centre strives for a non-violent society. Services/ Other Activities: ENBSEK is mainly involved in community awareness raising at village level. This is done through awareness workshops in communities; talks; provision of education materials; public rallies and marches; offer training on skills in areas of sustainable development; radio programs and plays; public and community awareness through theatre and drama. Profile: Set up in March 1996, although the programme to address violence against women and children started in August 1994 with staff of the Women’s Resource Centre and some sympathizers. Aims and Objectives: To provide a support network for victims of violence, to provide individual and family counselling, community awareness programs, and to look at ways of reforming laws which will better help victims of violence. The Centre strives for a non-violent society. Funding: Save the Children Fund (NZ) funded early in 1996. Profile: ICRAF is a non-profit, non-government organization wich was established in 1992 to deal with human rights, environment destruction, and land rights issues in PNG. It is staffed by lawyers, community workers and other professionals. The ICRAF programs are delivered through the lawyers and two program desks. These are the Women’s Desk and the Land and Environment Desk. The Women’s Desk was established as a result of the high rate of violence against women and children and the violation of their rights. It aims to specifically promote women’s rights in the social, cultural, political and economic development, to monitor the abuse of women’s rights and to provide counseling and legal aid for abused women. It is staffed by the Women’s Desk Coordinator who is the overall administrator of the program, two lawyers and volunteers. Aims and Objectives: To provide legal advise on human rights and environmental issues, to carry out awareness and educational campaigns, and to monitor the abuse of human rights and environment destruction. Services/ Other Activities: The women’s desk approach to the empowerment of women and protecting human rights is done by way of legal aid; awareness workshops and paralegal training; monitoring activities undertaken by state bodies, corporate bodies and individuals to ensure that they are not undermining the situation of women and children; and public advocacy and lobbying campaigns. There is also a Refuge/ Crisis Centre which was an initiative of the Women’s Desk of ICRAF and was established in April 1996. The Centre provides to women and children who seek help from domestic violence and other forms of violence. Information, counseling, support, temporary shelter and legal advise are provided free. Profile: This organisation represents an open door to services and resources supporting self-determined, self-help, sustainable development inititives. Resources and advocates community-based efforts to achieve Health, Education, sustainable Livelihood and Participation for all. Builds upon the foundations, experience and lessons of PNG’s past to support more equitable and effective development efforts for the future. Works with communities, local level Governments, peer NGOs and rural development training programs to build capacity in planning, management, implementation and evaluation of self-help initiatives. Role and working relationships emphasise partnership that are empowering and cumulative development of confidence, capacity and effectiveness of local women and men leaders, development workers and community-based organisations. Aims and Objectives: The goal of Help Resources is to provide resources and services to educate, empower and enable rural communites, to succeed in self-determined, self-help sustainable development initiatives. To develop and disseminate appropriate information, training and materials to support these efforts. Funding: Help Resources is funded by substantial grants from: German Development Service, Austrian Development Service, Canadian Government, New Zealand Government, Swis Caritas. Small grants from: IWDA, CAA, ASPBAE and individual donors. Profile: Has been working voluntarily in advocacy and education work on social development issues for the past 5 years. The troupe’s main work is advocacy of human rights, the provision of basic services and the protection of natural resources for all people in PNG, through drama, song and development discussion and dialogue with urban and rural communities. Throughout PNG communities are stressed by rapid and violent social, economic and political change. People are suffering from a lack on non-formal information and education services that might help them to better comprehned the world and the rapid changes around them. Bauabaua members are all recruited from grassroots urban communities in Wewak town. There are equal number of men and women and there is currently a special effort to build assertiveness and leadership among women members. The founding rector, Lucas Kou has almost 20 years of popular theatre experience and is deeply committed to achieving gender equality. Together they sing, write and act from their own experience and this gives them credibility and their work authenticity and power. They are constantly struggling to balance their commitment to the troupe with their commitment to their families and their struggle to survive in a society where the cost of living has soared, families are under pressure and community and family stresses have taken their toll on the quality of life. Among their most popular of their songs and plays are those with powerful messages about gender violence and women and children’s rights. The song that women inevitably request at the end of every performance is a typical account of wife beating, and its terrible consequences for the family. Baua baua is also doing work on reproductive health and rights and have been more effective than the government or UNFPA or SCR projects in getting men to take responsibility for contraception, and lowering the maternal and child mortality rates. In a society where literacy levels are low and access to information, media and communication are shrinking rather than expanding, popular, community based communication is the most effective in reaching and touching the people at large. Through the popular and participatory media, Baua baua are making a powerful contribution towards ending gender violence and making progress on achieving gender equality. Fax will be collected at the Town Post Office if prior notice is given. Profile:Kup Women for Peace was built on the collective effort of leading women activists in Kup to address issues of tribal fights, violence against women and children, and to build peace among the various clans and tribal groups. In March 2000, during a District Women's Council meeting, women from Kup Sub-District came together for the first time after one year of separation due to a major tribal fight in 1999 which saw many lives and property destroyed. Government services such as schools and health centre, police station were closed, and road blockages, which prevented people from entering enemy's land, and out-migration out of Kup. Concerned women leaders who were victims of tribal warfare and conflicts involving four major tribal groups formed Kup Women for Peace. Already the Group is working with the local Police, churches, Tribal Watch group, Village Courts, and others to educate for peace, human rights, civic pride, and sel-employment opportunities. The Group is struggling to bring about the awareness to respect human life and peace on earth. It is a big task in an area known for tribal fights, violence against women, and witch hunts. In this area, rarely does the offender become convicted of his crime because no one dares to be an informer. These women and their supporters will continue to build sisterhood among women in enemy tribes in order to build a bridge of peace and reconciliation and deeper bonds of friendship for the future. Awareness raising, education, and skills development training is an important part in building peace and restoration efforts to bring about normalcy and community building. Training will focus mainly on gender awareness workshops aiming to boost women's position in society both socially and economically will go hand in hand in all trainings. 16 Days activities Against Violence (Against Women) becomes a major activity where all Committees Against Violence in each of the villages will give their report on their work to assess strengths, weaknesses, and to keep working on mobilizing community effort to build peace. The Group needs to re-settle in Kup, their homeland first before they can operate from a central location. They are currently a mobile team moving from village to village with their message on peace, reconciliation, basic human rights of women and children, and re-settlement. They can only listen, lend a shoulder to cry on, and visit victims to provide whatever assistance they are able to provide. The Group is solely a women's group working with men to bring about social changes in Kup Sub-District, Simbu province. There are only three men in the decision making body. These men are respected community leaders holding important positions in the Village courts, the tribal watch group, and Christian churches. Assist in the introduction and provision of grassroots appropriate technology resources to promote self-reliant activities and rural employment.